Apple announced new pricing and capacities for its iPod line of digital media players at today's "It's Only Rock and Roll" media event. Most notably, the new generation of the iPod nano line receives numerous upgrades, including a video camera and FM radio with live pausing and iTunes tagging capability. The iPod touch gets a hardware upgrade for the high-capacity models and a price cut on the lowest-capacity model. The 8 GB iPod touch will be $199 (down from $249), while the 32 GB and 64 GB models will be $299 and $399, respectively. 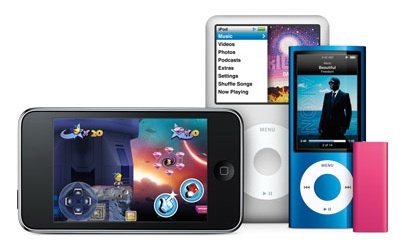 The 32 GB and 64 GB iPod touch models are "50% faster" than previous models and will run OpenGL ES 2.0. iPod touch owners who already have the latest 3.0 firmware will also be able to download the new iPhone OS 3.1 firmware, which is available today, at no charge, while those running older firmware versions can upgrade for $4.95. The only change to the iPod classic model is a capacity bump to 160GB, up from 120GB, at the same price point of $249. The iPod shuffle also receives a refresh today, including new pink, green and blue colors in addition to the original black and silver. A new polished stainless steel special edition model available only through Apple online and retail stores also joins the mix. The new iPod shuffle will be available in two capacities - 2 GB and 4 GB. The 2 GB model will be priced at $59 and the 4 GB model will be $79, while the stainless steel special edition will be priced at $99. Also, Apple is working with third-party headphone manufacturers to release new headphones that will be compatible with the iPod shuffle's feature set. The iPod nano receives the most noticeable feature changes with the addition of a video camera, an FM radio, Voice Over, and the new Genius Mix feature. The iPod nano will also have a slightly larger screen at 2.2 inches within the same form factor as the previous model and with a polished anodized aluminum casing. To support video recording, a microphone and speaker are also added, as well a built-in pedometer. Available today at $149 for the 8 GB version and $179 for the 16 GB version, the iPod nano will also be available in nine different colors. All updated iPod models are available today.